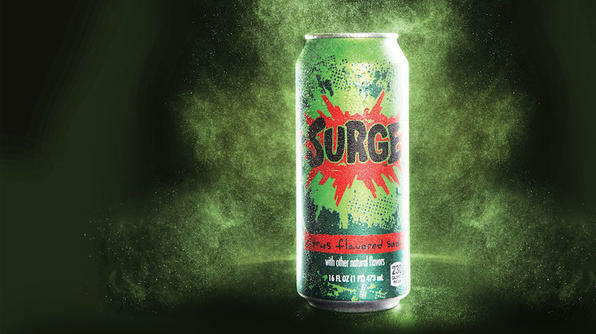 SURGE is BACK … and in STORES! The ‘90’s are calling, and they want their favorite citrus-flavored soda back. Following a successful year-long pilot on Amazon.com, the SURGE™ comeback continues this week in select convenience stores and gas stations in 23 states across the Midwest, Southeast and Great Lakes. A map pointing fans to retailers with SURGE in stock can be found at www.SURGE.com. “We’re continuing to listen to SURGE fans and rewarding them with expanded distribution in areas where demand and loyalty for the brand is highest,” said Kimberly Paige, vice president, Sprite and Flavors, Coca-Cola North America. Coca-Cola introduced SURGE in 1996 but took it off the market in 2003. The brand amassed a cult-like following among its young male-dominated fanbase, who loved its bright green color, bold citrus taste and quirky sense of humor. Last September, Coca-Cola responded to the passionate and persistent efforts of The SURGE Movement – a Facebook community, led by three twenty-something men, that lobbied the company to bring back their favorite drink – by re-launching SURGE through a unique e-commerce partnership with Amazon.com. Thirsty fans quickly scooped up 12-packs of 16 oz. cans online. In fact, Coca-Cola had trouble keeping SURGE in stock given the overwhelming demand. Based on these initial results, the company green-lit a small retail test in the Midwest and Southeast earlier this year. SURGE fever has extended into the Midwest, too. “The fun is in selling this brand, knowing there are so many loyal and passionate consumers we’re serving,” said Darin Carlson, account director at Viking Coca-Cola, which distributes Coca-Cola products in Minnesota and Wisconsin. The bottler hosted a community event this week in Fergus Falls, Minn. honoring hometown hero and one of The SURGE Movement’s three admins, Matt Winans. While the brand’s back-by-popular-demand second act can largely be credited to consumers yearning for the SURGE of yesteryear, plenty of newcomers are finding a fresh favorite. 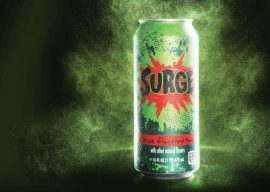 “SURGE superfans have amazing stories to tell and have been so instrumental in bringing back SURGE, but younger, variety-seeking consumers are also intrigued by this brand because to them it’s new and different,” Paige said. New fans are discovering SURGE not through traditional advertising, but through the brand’s social media channels thanks largely to The SURGE Movement – led by Winans, Evan Carr and Sean Sheridan – who continue to manage the SURGE Facebook page (more than 224,000 “likes”) with input from the brand team. A “Friendshare Friday” feature on Facebook has helped recruit new SURGE consumers in recent months. Check out SURGE.com to find out where you can find SURGE in store, or visit Amazon Prime Pantry to order your own personal shipment. Full and original article here!